Just how important is what your dog eats? So you know your dog better than anyone else, right? You can probably tell us his or her favorite toy, favorite activity, and favorite spot to sleep. 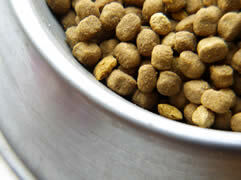 Now how about some basics about your pet’s diet….Can you tell us how much your dog eats, and how often? What does he or she eat—I don’t mean what is the pretty name on the bag, but what’s really in that bag? Could you name the main protein source for me? Can you tell me if your dog has any food allergies or sensitivities, and would you be surprised if I told you that a common presentation for such issues present as skin irritation? We realize you may not even read the labels on everything that you eat. 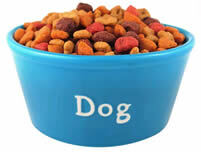 However, since you probably tend to stick to a certain dog food once you find a good match for your pooch or pack, consider making the choice rigorously just once, so that you can feel confident about the nutrition you provide your best friend. The gimmicks are everywhere. The brands all try to separate themselves from the competition as being more natural or better to prolong your dog’s life. However, many of the top brands are made together in the same factory, with many of the same ingredients. If you don’t do your homework, you could fall for the oldest trick in the book—MARKETING. Below is a quiz to “grade” your dog’s food—it circulates in dog-blogs but the original source is unknown. The basics are, knowing where the protein comes from, avoiding by-products, and avoiding poorly digestible “fillers” like corn. Next, know the common allergies, as this may affect each dog differently. Common triggers in foods are wheat, corn, soy, glutens, and for some dogs, beef. The grains listed are double trouble as they are also susceptible to mold and can therefore expose your dog to mycotoxins (mold toxins). “Grade” your food with this quiz, and think about why it did so well/poor and if you should make changes. It is important to remember that just because a food has a score over 100, it may not work for every dog. When you find a high quality food that your dog loves and does well on (stable tummy, etc), you have found your match. Also keep aware of the news reports on recalls, etc, because even the best brands run into manufacturing or supply issues, and being aware could save Fido from potential health risks. When your pooch comes to Pawtropolis, you can be sure he or she gets the highest quality foods! If you are boarding, your dog will receive an A-rated kibble, and if you’re shopping, look around at the foods P-trop offers and check the list! You’ll see some of the top performers on the store shelves! If you are thinking about changing your dog’s diet and need some input, just ask P-trop owner Amanda Crook—she loves to make sure her customers are healthy and coming to P-trop for years to come! 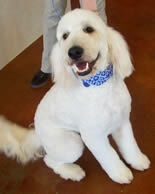 Tired of all that shedding with your short haired dog? Regular baths help take the dead fur off where you want it...in the tub. A quartely deshedding makes a big difference too.